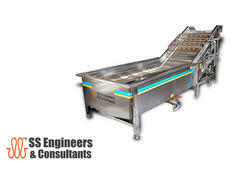 Pioneers in the industry, we offer vegetable/fruit top and bottom spray washing machine, onion and potatoes grading and sorting line, vegetable washer, blanching machine, ginger washing and vegetable and fruit cutting washing line from India. 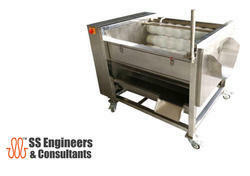 We are offering Top & Bottom Spray Washing Machine Vegetable/Fruit to our client. 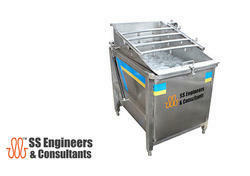 SS Engineers & Consultants also manufactures quality and safety proven fruit and Vegetable Washer with years of experience in fruit and vegetable washing machines, SSEC is committed to providing its users with exceptional performance and services. To meet the growing demand for Vegetable Leafs cleaning equipment, SSEC incorporates sophisticated technologies to enhance the power and convenience of each cleaning machine. In fact, SSEC is the most respected in the industry for its production of high quality, efficient cleaning machines, whether you are looking for a commercial or industrial cleaning equipment. 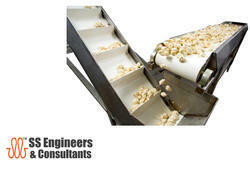 SS Engineers & Consultants has developed its own know how & manufacturing in the sector of fresh vegetables receiving – unloading – washing - drying - sorting, later providing integration in vegetables peeling / dicing / crushing processing and dehydrating. 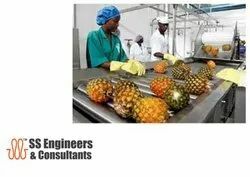 SS Engineers & Consultants directly operate in the market as machinery builders of fresh fruit and vegetables processing lines with a manufacturing portfolio and a wide reference list ranging from single equipment to complete turn-key lines ranging from 1ton to 20 tons / hour. SSEC Ginger Washing Machine is suitable for fresh ginger, potatoes, carrots and other root vegetable washing and peeling, replace soft brush can clean water chestnut, carrot polishing. Its advantage is it can be fully removable to make the machine easy cleaning. 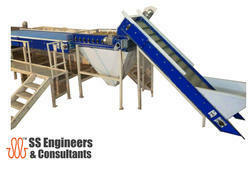 SSEC Ginger Washing Machine combines with the brush, motor and the spraying pipes to peeling the root vegetables. Put the materials into the machine before turning on the switch, and the water pipes will spray, the brush will rotate to make the materials washing and peeling, and the dirt’s will outflow under the brush.When I finish washing, just opens the right discharge hole to output the finished products, then turn off switch. 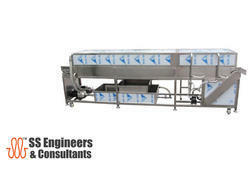 We are offering Vegetable And Fruit Cutting Washing Line to our client. equipment to complete turn-key lines ranging from 1ton to 20 tons/hour. 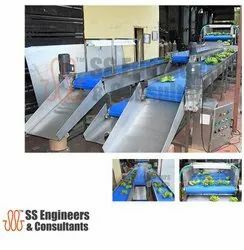 Potato Weighing Packing Processing Line: Washing-peeling-polishing-inspecting-cutting-cleaning-weighing-packing.It is a fully automatic processing line for vegetable roots like potato, carrot, radish, beets, turnip etc. The processing of honey is done mainly to prevent fermentation and retard granulation. 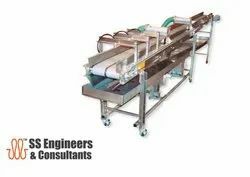 SS Engineers & Consultants offers Honey processing plant of various capacities, SS Engineers has continuous R & D department to improve the honey processing technology. SS Engineers Honey processing plant consists of, Storage Tank (For Raw honey).It is made of stainless steel (SS 304) sheets with SS Screen for straining raw honey. Honey pump made of Stainless steel, positive displacement metering pump, adjustable to the required output. Heating Unit: Triple jacketed vessel with SS heating coils to heat the honey to the required temperature. Processing Skid Honey Processing Unit: - The temperature of honey in processing coil is maintained at 65 degree Celcius maximum. All the yeast cells present in honey will be killed at this temperature. Then it will pass in cooling tank. Thus processed and filtered, cooled honey will be collected in settling tank. The air bubbles and scum will be separated by a vertical diaphragm in settling tank then bottled. The honey pump is adjusted to the required flow. Moisture Reduction Unit:- Honey is then heated to the required temperature for a specific period and passed into Falling Film Evaporator (Condenser). Vacuum is simultaneously applied to boil the water in honey at the lower temperature so that moisture is separated which can be collected separately. This procedure also helps in destroying yeasts. The processing of honey Preheating: The raw honey is to be heated first at 40-45°C (Approx) for 30 min with constant stirring to make homogeneous honey, stirring at the rate of 50 rpm. Filtration: -Preheated honey at 40-45°C (Approx) is filtered through 80-100 mesh (40-50 micron) so as to separate solid wax particles, honey processing plant, pollen grains and other foreign materials. Pressure should not exceed 1.5 kg/cm2 during filtration otherwise there is the chance of mixing air with honey.That is churning like. Processing of Honey:-Temperature of honey should be maintained at 60 -65°C (Approx) for 20 or 15 min respectively. Then honey is taken into a cooling tank or settling tank to maintain at 25° 30°C (Approx). Settling of honey:- Processed and cooled honey is allowed to settle at 25° 30°C (Approx) to separate the foam/scum at the top and clear liquid at the bottom. The foam/ scum can be removed by scooping manually. Existing settling tank of 500 kg honey may be allowed to keep for more than 4-5 days undisturbed without adding further honey at room temperature 25-30°C (Approx). With this process, the Original flavor, aroma, and glucose of the honey are preserved in its original form. 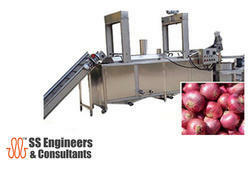 The SS Engineers small and medium-sized vegetable processing machine perfectly suits every production house. The vegetables/fruits are been cleaned through whirl / high-pressure bubble generator to achieve intensively cleaning results. We developed a system like Sugar Syrup Plant or sugar syrup making system to prepare continuous sugar syrup with its sugar handling system. Bag filter and screw conveyor are used to convey sugar into the silo. The PLC controlled sugar handling system very minutely discharges sugar and water in an accurate proportion continuously to the first stage electrically heated the stirring tank. The overflow from the first stage goes to the second stage heated stirring tank and overflow from the second stage goes to the third stage heated the stirring tank. At the third stage tank, the correct and continuous dosage of an inverter is taking place. Thus at the third stage sugar syrup attains correct temperature and quality. The overflow from the third stage is taken into fourth stage water cooled coil tank. At this level, we achieve correct quality and cooled sugar syrup. The sugar syrup is then pumped through a filter into tile overhead storage tank. The system is energy efficient as the power required is 50% of normal operation since tanks are insulated and incoming feed water is preheated.